and fits in a small corner of my yard. If you are curious about composting but are limited by the size of your outdoor space and don't want to spend hundreds of dollars on fancy rotating composting bins, I encourage you to get started now. 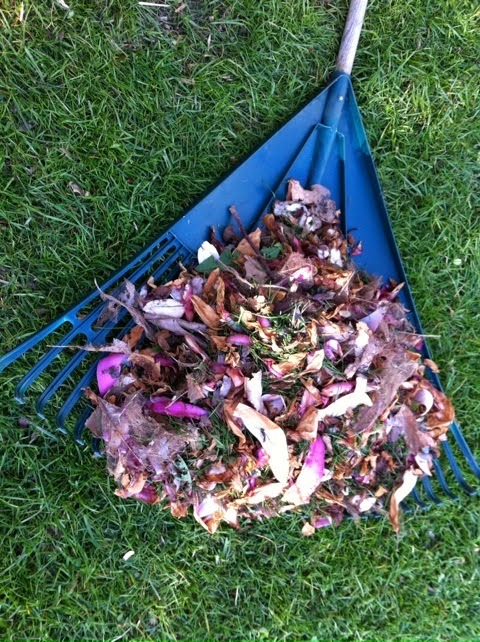 There is so much plant material available to start you off on your composting journey with the spring garden clean up. Next year you can have your own nutrient rich soil to add to your garden or containers. I live in a suburban area with limited lot sizes. There isn’t a great deal of space for expansive gardens and the virtually free compost piles. But I also know the benefits of composting. 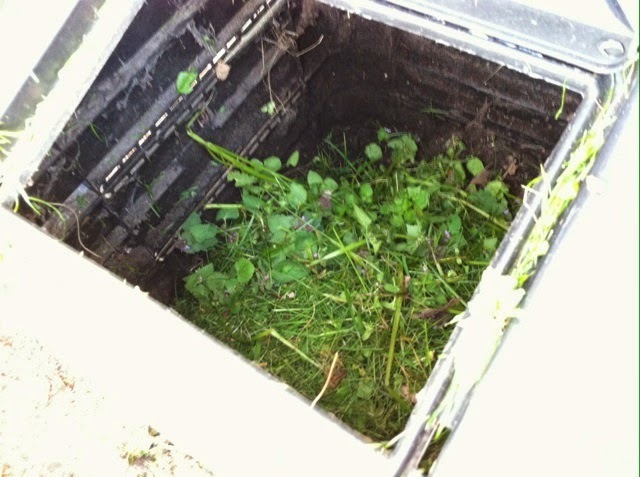 It is possible to make compost in a limited space on a limited budget. It is the time of year for me to add good quality, nutrient rich organic material to my raised beds. With the wet weather that we get in the pacific northwest, essential nutrients can be washed away. While I do add some commercial fertilizer (mushroom and fish manure) to my soil, I like to add as much of my homemade compost to my garden. Not only am I saving money, I know exactly what has gone into my bins. Look at the gorgeous colour! I use upright compost containers from my city, which are perfect for limited space gardens and limited budgets. Many of the people who have garden plots in our local community gardens use these in their limited plots because they are so compact. They have an open bottom so beneficial microbes and critters can enter and help the composting process. 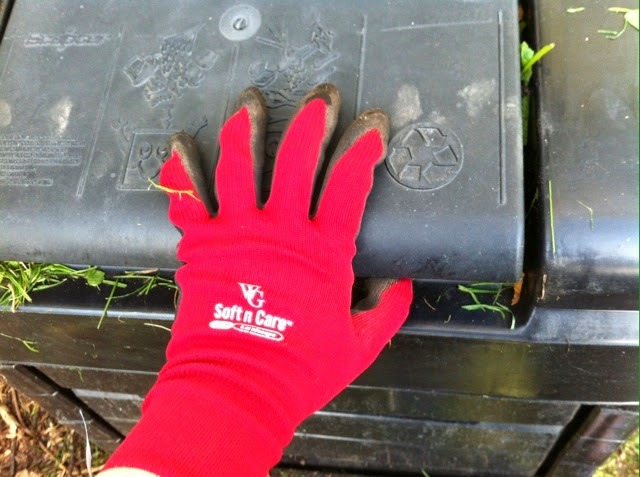 When I take the lid off I need to use gloves: too many spiders. It really is easy. Layer alternating green and brown layers, water occasionally, create air holes and that’s it. To read more of my lazy composting method, read here. to add to my bin. 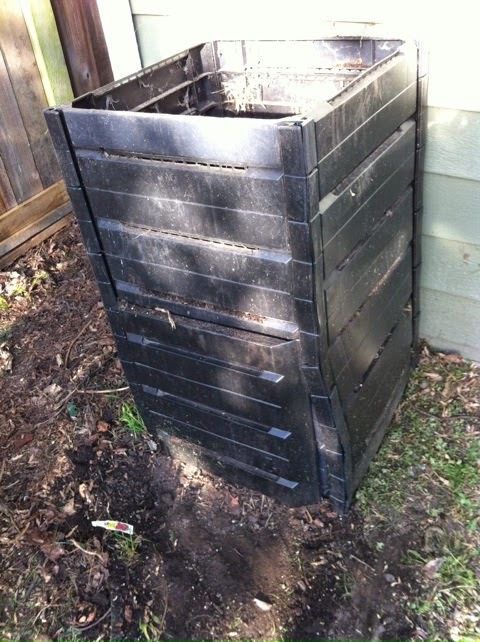 After approximately a year I open up a panel on the front side of the bin and start digging out the composted soil. The material closest to the top is from the fall clean up and isn’t ready to use. When I close the side panel I can push down the material from the top and begin adding new green and brown layers. 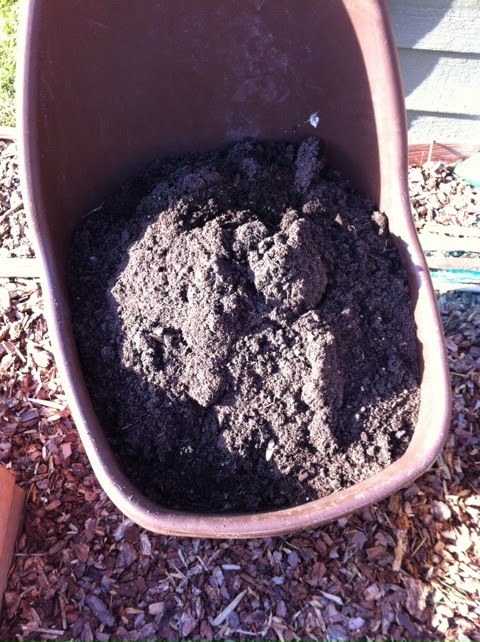 From my one small bin this spring I have been able to use three wheel barrows of usable compost. left over for my containers or to share with a neighbour. It’s so easy to just throw grass cuttings all summer and leaves in the fall into the bin. Even if you don’t grow a vegetable garden, the compost can be sprinkled lightly onto lawns, used in flower planters, or shared with a neighbour or friend who doesn’t have access to yard space. That is fabulous especially that your city supplies them. Where I work has a kitchen and I've been talking to the kitchen manager about composting. This small nicely contained unit would be perfect there. For myself, I use the 2 piles inside a coated wire fence and flip the new one over 1x per year method. (where it becomes the old one and has nice soil the next spring). But I have a bit of extra space. My county used to provide those compost bins as well. Now we have city composting. I still do my own though. Sure, composting is great for lowering the amount of garbage we send to landfills but us gardeners know that compost is even better for all the free, healthy soil it provides!! Such a timely post. I was just thinking today of all the garden clean up that I'd have and how happily full my compost bin would be when I am done. I love your cheapskate method! I wish my city supplied us with something like that. I just have a big pile in my backyard (in a makeshift compost bin made out of pallets), but it's such a pain to turn over and it takes so long for it to get composted down to where I can use it. When I saw the photo of your end product, I will admit that I oohed and ahhed over it and then felt immediately jealous. Jealous that your city provides those!